Network management refers to the activities, methods, procedures, and tools that pertain to the operation, administration, maintenance, and provisioning of networked systems, which includes controlling, planning, allocating, deploying, coordinating, and monitoring the resources of a network. This book brings all of the elements of network management together in a single volume, saving the reader the time and expense of making multiple purchases. It introduces network management, explains the basics, describes the protocols, and discusses advanced topics, by the best and brightest experts in the field. It is a quick and efficient way to bring valuable content together from leading experts in the field while creating a one-stop-shopping opportunity for customers to receive the information they would otherwise need to round up from separate sources. 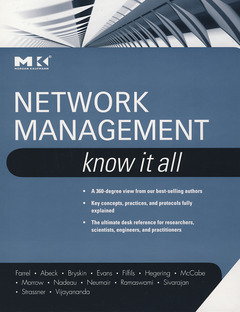 * Chapters contributed by recognized experts in the field cover theory and practice of network management, allowing the reader to develop a new level of knowledge and technical expertise. * This book's up-to-date coverage of network quality of service issues facilitates learning and lets the reader remain current and fully informed from multiple viewpoints. * Presents methods of analysis and problem-solving techniques, enhancing the reader's grasp of the material and ability to implement practical solutions. * Use of examples illustrate core network management concepts for enhanced comprehension. Network researchers, engineers, architects, operators, administrators, and managers, as well as related practitioners such as telco managers, network software developers, etc.